Surfing is a surface water sport in which the wave rider, referred to as a surfer, rides on the forward or deep face of a moving wave, which usually carries the surfer towards the shore. Waves suitable for surfing are primarily found in the ocean, but can also be found in lakes or rivers in the form of a standing wave or tidal bore. However, surfers can also utilize artificial waves such as those from boat wakes and the waves created in artificial wave pools. 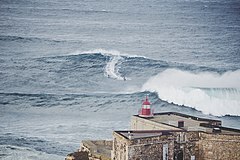 Three major subdivisions within stand-up surfing are stand-up paddling, long boarding and short boarding with several major differences including the board design and length, the riding style, and the kind of wave that is ridden. In tow-in surfing (most often, but not exclusively, associated with big wave surfing), a motorized water vehicle, such as a personal watercraft, tows the surfer into the wave front, helping the surfer match a large wave's speed, which is generally a higher speed than a self-propelled surfer can produce. Surfing-related sports such as paddle boarding and sea kayaking do not require waves, and other derivative sports such as kite surfing and windsurfing rely primarily on wind for power, yet all of these platforms may also be used to ride waves. Recently with the use of V-drive boats, Wakesurfing, in which one surfs on the wake of a boat, has emerged. 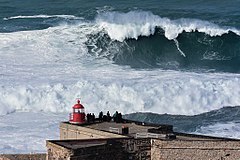 The Guinness Book of World Records recognized a 78 foot (23.8 m) wave ride by Garrett McNamara at Nazaré, Portugal as the largest wave ever surfed. In 1907, the eclectic interests of the land baron Henry E. Huntington brought the ancient art of surfing to the California coast. While on vacation, Huntington had seen Hawaiian boys surfing the island waves. Looking for a way to entice visitors to the area of Redondo Beach, where he had heavily invested in real estate, he hired a young Hawaiian to ride surfboards. George Freeth decided to revive the art of surfing, but had little success with the huge 16-foot hardwood boards that were popular at that time. When he cut them in half to make them more manageable, he created the original "Long board", which made him the talk of the islands. To the delight of visitors, Freeth exhibited his surfing skills twice a day in front of the Hotel Redondo. Another native Hawaiian, Duke Kahanamoku, spread surfing to both the U.S. and Australia, riding the waves after displaying the swimming prowess that won him Olympic gold medals in 1912 and 1920. Swell is generated when the wind blows consistently over a large area of open water, called the wind's fetch. The size of a swell is determined by the strength of the wind and the length of its fetch and duration. 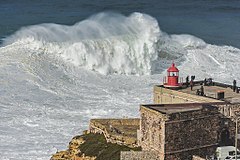 Because of this, surf tends to be larger and more prevalent on coastlines exposed to large expanses of ocean traversed by intense low pressure systems. Local wind conditions affect wave quality since the surface of a wave can become choppy in blustery conditions. Ideal conditions include a light to moderate "offshore" wind, because it blows into the front of the wave, making it a "barrel" or "tube" wave. Waves are Left handed and Right Handed depending upon the breaking formation of the wave. The most important influence on wave shape is the topography of the seabed directly behind and immediately beneath the breaking wave. The contours of the reef or bar front become stretched by diffraction. Each break is different since each location's underwater topography is unique. At beach breaks, sandbanks change shape from week to week. Surf forecasting is aided by advances in information technology. Mathematical modeling graphically depicts the size and direction of swells around the globe. East coasts also receive heavy winter swells when low-pressure cells form in the sub-tropics, where slow moving highs inhibit their movement. These lows produce a shorter fetch than polar fronts, however, they can still generate heavy swells since their slower movement increases the duration of a particular wind direction. The variables of fetch and duration both influence how long wind acts over a wave as it travels since a wave reaching the end of a fetch behaves as if the wind died. The geometry of tube shape can be represented as a ratio between length and width. Tube speed is defined by angle of peel line. The sport is also a significant part of Australia's eastern coast sub-cultural life, especially in New South Wales, where the weather and water conditions are most favourable for surfing. During the 1960s, as surfing caught on in California, its popularity spread through American pop culture. Several teen movies, starting with the Gidget series in 1959, transformed surfing into a dream life for American youth. Later movies, including Beach Party (1963), Ride the Wild Surf (1964), and Beach Blanket Bingo (1965) promoted the California dream of sun and surf. Surf culture also fueled the early records of the Beach Boys. The sport of surfing now represents a multibillion-dollar industry especially in clothing and fashion markets. The World Surf League (WSL) runs the championship tour, hosting top competitors in some of the best surf spots around the globe. A small number of people make a career out of surfing by receiving corporate sponsorships and performing for photographers and videographers in far-flung destinations; they are typically referred to as freesurfers. Sixty-six surfboarders on a 42-foot surfboard set a record in Huntington Beach, California for most people on a surfboard at one time. Dale Webster consecutively surfed for 14,641 days, making it his main life focus. Catching waves at a surfing contest on the North Shore of Oahu, Hawaii. 540 degrees – the surfer does a full rotation plus another 180 degrees, and can be inverted or spinning straight, few surfers have been able to land this air. Indy – a grab on the surfers (inside rail going frontside, outside rail going backside) with their back hand. Lien – A grab on the surfers (outside rail frontside, inside rail going backside) with their front hand. The repetitive cycle of paddling, popping up, and balancing requires stamina, explosivity, and near-constant core stabilization. Having a proper warm up routine can help prevent injuries. Table 1 shows a relationship of smaller peel angles correlating with a higher skill level of surfer. Smaller wave peel angles increase the velocities of waves. A surfer must know how to react and paddle quickly to match the speed of the wave to catch it. Therefore, more experience is required to catch a low peel angle waves. Also, more experienced surfers can handle longer section lengths, increased velocities, and higher wave heights. Different locations offer different types of surfing conditions for each skill level. For example: Surfing in Indonesia. A surf break is an area with an obstruction or an object that causes a wave to break. Surf breaks entail multiple scale phenomena. Wave section creation has micro-scale factors of peel angle and wave breaking intensity. The micro-scale components influence wave height and variations on wave crests. The mesoscale components of surf breaks are the ramp, platform, wedge, or ledge that may be present at a surf break. Macro-scale processes are the global winds that initially produce offshore waves. Types of surf breaks are headlands (point break), beach break, river/estuary entrance bar, reef breaks, and ledge breaks. Rip currents can be extremely strong and narrow as they extend out of the surf zone into deeper water, reaching speeds of 1–2 feet per second to 8 feet per second. The water in the jet is sediment rich, bubble rich, and moves rapidly. The rip head of the rip current has long shore movement. Rip currents are common on beaches with mild slopes that experience sizeable and frequent oceanic swell. Surfing, like all water sports, carries the inherent risk of drowning. Anyone at any age can learn to surf, but should have at least intermediate swimming skills. Although the board assists a surfer in staying buoyant, it can become separated from the user. A leash, attached to the ankle or knee, can keep a board from being swept away, but does not keep a rider on the board or above water. In some cases, possibly including the drowning of professional surfer Mark Foo, a leash can even be a cause of drowning by snagging on a reef or other object and holding the surfer underwater. By keeping the surfboard close to the surfer during a wipeout, a leash also increases the chances that the board may strike the rider, which could knock him or her unconscious and lead to drowning. A fallen rider's board can become trapped in larger waves, and if the rider is attached by a leash, he or she can be dragged for long distances underwater. Surfers should be careful to remain in smaller surf until they have acquired the advanced skills and experience necessary to handle bigger waves and more challenging conditions. However, even world-class surfers have drowned in extremely challenging conditions. Under the wrong set of conditions, anything that a surfer's body can come in contact with is a potential hazard, including sand bars, rocks, small ice, reefs, surfboards, and other surfers. Collisions with these objects can sometimes cause injuries such as cuts and scrapes and in rare instances, death. A large number of injuries, up to 66%, are caused by collision with a surfboard (nose or fins). Fins can cause deep lacerations and cuts, as well as bruising. While these injuries can be minor, they can open the skin to infection from the sea; groups like Surfers Against Sewage campaign for cleaner waters to reduce the risk of infections. Local bugs and disease can be risk factors when surfing around the globe. The seabed can pose a risk for surfers. If a surfer falls while riding a wave, the wave tosses and tumbles the surfer around, often in a downwards direction. At reef breaks and beach breaks, surfers have been seriously injured and even killed, because of a violent collision with the sea bed, the water above which can sometimes be very shallow, especially at beach breaks or reef breaks during low tide. Cyclops, Western Australia, for example is one of the biggest and thickest reef breaks in the world, with waves measuring up to 10 meters (33 feet) high, but the reef below is only about 2 meters (6.6 feet) below the surface of the water. Surfers should use ear protection such as ear plugs to avoid surfer's ear, inflammation of the ear or other damage. Surfer's ear is where the bone near the ear canal grows after repeated exposure to cold water, making the ear canal narrower. The narrowed canal makes it harder for water to drain from the ear. This can result in pain, infection and sometimes ringing of the ear. If surfer's ear develops it does so after repeated surfing sessions. Yet, damage such as inflammation of the ear can occur after only surfing once. This can be caused by repeatedly falling off the surfboard into the water and having the cold water rush into the ears, which can exert a damaging amount of pressure. Those with sensitive ears should therefore wear ear protection, even if they are not planning to surf very often. ^ "Surfer rides World Record 78-foot wave". BBC News. 12 May 2012. Retrieved 29 January 2013. ^ Fleming, F. (c. 2005). Off the Map: Tales of Endurance and Exploration, p. 154. Atlantic Monthly Press. ^ Twain, Mark (2007). Roughing It. Lawrence, Kansas: Digireads.com Publishing. p. 264. ISBN 9781420930283. ^ Krämer, Augustin (2000). The Samoa Islands. ISBN 9780824822194. Retrieved 8 November 2014. ^ Geoffrey Dunn; Kim Stoner (31 March 2010). "Riders of the Sea Spray". goodtimes.sc. Retrieved 8 November 2014. ^ a b "Woman of the Year". Surfing Walk of Fame. Archived from the original on 6 August 2017. Retrieved 11 December 2017. ^ The Bluffer's Guides, The Bluffer's Guide to Surfing, Oval Books, 2008. ^ Clayton Truscott (23 September 2009). "Seli 1: One Year On". ZigZag. Online Publishers Association South Africa. Retrieved 25 May 2012. ^ TNN (20 May 2010). "India's first artificial reef to protect Kovalam". The Times Of India. Retrieved 25 May 2012. ^ Duncan Scott (8 November 2000). "MADE IN JAPAN Unlike its counterparts, Miyazaki's Ocean Dome wavepool is for real". Surfline. Surfline/Wavetrak, Inc. Retrieved 25 May 2012. ^ "Sustainable inland surfing destinations". The Wave Bristol. Retrieved 11 December 2017. ^ "Kelly Slater Wave Company". Kelly Slater Wave Company. Retrieved 14 May 2018. 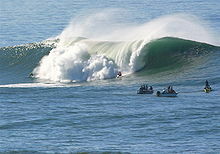 ^ "NLand Surf Park - The only surfing destination of its kind in North America". NLand Surf Park. Retrieved 14 May 2018. ^ Rose, Brent (10 May 2018). "Is The First Pro Surfing Contest In A Wave Pool The Sport's Future, Or Its Bastardization?". Deadspin. Retrieved 11 May 2018. ^ "The Spirituality Of Surfing: Finding Religion Riding The Waves". huffingtonpost.com. Retrieved 26 August 2015. ^ Finney, Ben; Houston, James D. (1996). 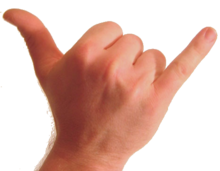 "Appendix A – Hawaiian Surfing terms". Surfing – A History of the Ancient Hawaiian Sport. Rohnett, CA: Pomegranate Artbooks. pp. 94–97. ISBN 978-0-87654-594-2. ^ Guisado, Raul (2003). "Appendix A – Glossary of Surfing Lingo". The Art of Surfing: A Training Manual for the Developing and Competitive Surfer. Guilford, CT: Globe Pequot Press. pp. 165–0170. ISBN 978-0-7627-2466-6. ^ Kristian Hansen (20 November 2017). "How to surf; learn to surf in one day". hvsboardsport.com. Hvs Boardsport. Archived from the original on 1 December 2017. Retrieved 20 November 2017. ^ "The quick guide on how to surf". learnhowtosurf.info. Archived from the original on 31 August 2012. Retrieved 26 August 2015. ^ "Warm Up So You Don't Wipe Out". Men's Health. 1 August 2017. Retrieved 13 November 2018. ^ Surfer (15 September 2014). "Bigger and Better". Surfer Magazine. Surfer Magazine. Retrieved 29 December 2014. ^ Kotler, Steven (13 June 2006). West of Jesus: Surfing, Science, and the Origins of Belief. Bloomsbury. ISBN 978-1-59691-051-5. ^ a b c d Talley, Lynne D. (2011). "Chapter 8. Gravity Waves, Tides, and Coastal Oceanography". Descriptive Physical Oceanography: An Introduction. Academic Press. pp. 223–244. ISBN 978-0-08-093911-7. ^ a b c d e f g h i j k l m n o p q r s Scarfe, Bradley E.; Terry R. Healy, and Hamish G. Rennie (2009). "Research-Based Surfing Literature for Coastal Management and the Science of Surfing—A Review". Journal of Coastal Research. 25 (3): 539–557. doi:10.2112/07-0958.1. ^ a b Madsen, P.A. ; O.R. Sørensen, and H.A. Schäffer (1997). "Surf zone dynamics simulated by a Boussinesq type model. Part I. Model description of cross-shore motion of regular waves". Coastal Engineering. 32 (4): 255–287. doi:10.1016/S0378-3839(97)00028-8. ^ a b c d Edge, Ronald (2001). "Surf Physics". The Physics Teacher. 39 (5): 272–277. Bibcode:2001PhTea..39..272E. doi:10.1119/1.1375464. ^ HURT, GAREK. "THE DIFFERENCES BETWEEN BEACH BREAKS, POINT BREAKS, AND REEF BREAKS". Degree 33 Surfboards. Retrieved 26 November 2017. ^ a b Dalrymple, Robert A. (1978). "Rip Currents and Their Causes". Coastal Engineering. 1 (16): 1414–1427. ^ a b c d Smith, Jerome A.; John L. Largier (1995). "Observations of nearshore circulation: Rip currents" (PDF). Journal of Geophysical Research. 100 (C6): 10967–10975. Bibcode:1995JGR...10010967S. doi:10.1029/95JC00751. Archived from the original (PDF) on 18 September 2015. ^ a b c Bowen, Anthony J. (1969). "Rip Currents: Theoretical Investigations" (PDF). Journal of Geophysical Research. 74 (23): 5467–5477. Bibcode:1969JGR....74.5467B. CiteSeerX 10.1.1.463.6097. doi:10.1029/JC074i023p05467. Archived from the original (PDF) on 12 June 2010. ^ a b Arthur, Robert S. (1962). "A Note on the Dynamics of Rip Currents". Journal of Geophysical Research. 67 (7): 2777–2779. Bibcode:1962JGR....67.2777A. doi:10.1029/JZ067i007p02777. ^ "Is Surfing Dangerous?". HVS Boarsport. 1 January 2018. Retrieved 1 January 2018. ^ "Ocean Safety". Retrieved 8 November 2014. ^ a b "Sony Pictures Classics: Riding Giants". Retrieved 8 November 2014. ^ Borte, Jason. "Mark Foo Biography". Surfline. Retrieved 12 July 2012. ^ "Dangers – Hard Bottoms". Surfing San Diego. Site Tutor Inc. Archived from the original on 26 September 2012. Retrieved 26 September 2012. ^ "Dangers of Surfing". Surfboard Shack. Surfboard Shack. 2011. Retrieved 26 September 2012. ^ Mike Lewis (2 November 2010). "ANDY IRONS PASSES AWAY, CAUSE UNDER INVESTIGATION". Transworld Business. Bonnier Corporation. Retrieved 26 September 2012. ^ "Unprovoked White Shark Attacks on Surfers". Shark Research Committee. Retrieved 20 September 2010. ^ "Surf Dangers Animals". Archived from the original on 20 April 2007. ^ "Doing the 'Stingray Shuffle'". ABC News. 5 September 2006. Retrieved 26 August 2015. ^ "Surfing's hidden dangers". BBC News. 7 September 2001. Retrieved 24 May 2010. ^ University of Exeter (14 January 2018). "Surfers three times more likely to have antibiotic-resistant bacteria in guts". Eurekalert. Retrieved 15 January 2018. ^ "Surfer's Ear – An Inconvenient Truth". MSW. 4 April 2014. Retrieved 15 July 2018. Baron, Zach (15 May 2017). "At Home With the Best Surfer on the Planet". GQ. Retrieved 11 December 2017.